What is an Radial Gate ? 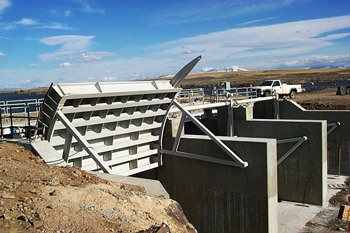 The Radial Gate is the most common type of spillway gate in use. The water flows under the radial gate therefore its classified as an "undershot gate". It consists of a skin plate which is curved (segment of a circle), reinforced as necessary and supported by a structural steel frame. The gate is raised and lowered via a two cable hoist system. In a radial gate the water pressure is transferred from the curved face and the horizontal support beams to the radial gate arms which transfers the load to a common bearing which is located on either side of the gate opening. -	An epoxy painted curved steel gate c/w attachable reinforced arms. -	Stainless Steel pivot pin c/w self – lubricated bearings. -	Stainless steel bottom and side rubbing plate embeddements. Options Include: -	Radial gate can be designed with an open top – three sided seal arrangement used in overflow conditions and in a closed top – four sided seal arrangement, referred to as a breast wall configuration.